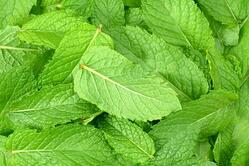 This month’s newsletter is full of Aromatherapy recipes for stress relief! I’m just kidding! I always make time to be sure our newsletter is full of great recipes and useful information for you. I just couldn’t resist opening with a little joke about being busy, because the recipes below are all about stress relief—perfect if you’re feeling overworked, overwhelmed, or a little worried and sleep-deprived. 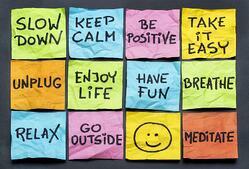 There’s a roll-on oil to help you feel calm but mentally sharp, and a “Bye Bye Stress” Inhaler. There’s also a list of natural products you can make (such as a linen spray or bath salt), along with suggestions for essential oils to add. Choose a product, choose your essential oils, and blend them to create your own unique stress relief blend. I also have some fun news to share! I’ve created an online class about Frankincense essential oil (specifically about Boswellia carterii)! It’s called the Frankincense Spotlight Webinar. You can read more about it in the section below. Life is such a beautiful journey...but sometimes it can feel like the journey itself can get in the way of remembering that. Aromatherapy is here to remind us! Frankincense is a favorite essential oil for many people (including me!). If you love Frankincense, or you simply want to learn more about how to use it, this three hour webinar class is for you. This class is a chance to settle in for a few hours and get to know this calming, nourishing, restoring essential oil. If you already love Frankincense, this is a great way to meet new sides of an old friend. And if you're not familiar with all of Frankincense's talents, this webinar offers the perfect introduction. It has so many beautiful therapeutic uses. Five recipes that we will explore in this online class include: Frankincense's Relaxing Diffuser Stock Blend, Frankincense's Massage and Yoga Diffuser Stock Blend, Frankincense Forest Incense, Frankincense & Coconut's Fabulous Deodorant, and Frankincense Head & Neck Relief Blend. You'll also learn what Frankincense has in common with the other seven essential oils in the recipes above: Green Mandarin, Jasmine absolute, Juniper, Elemi, Bergamot, Cypress, and Ylang Ylang. You'll learn about their properties and how to blend with them. The webinar is $35, and will be on August 22 at 1 PM Eastern USA. If you can’t make the webinar on that day, don’t worry. You can go ahead and sign up, because I’m going to record the webinar for everyone who registers. Your webinar will be stored in your Aromahead account, so you can watch it any time. Frankincense’s webinar will be educational and fun. 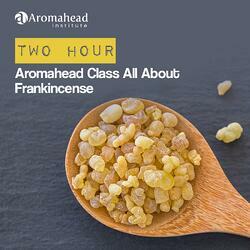 You might even call it “meditative!” Frankincense and I will see you on the webinar! You can find roll-on bottles for this blend at Aromatics International. To make it, simply combine the ingredients in the bottle, snap the roller-top into place, and roll it onto your wrists, neck, or anywhere you’d like. There are some great essential oils that encourage a calm state of mind, reduce stress, and support sleep. And now for the essential oils! Pick your favorite blend below and add it to one of the carriers above to create your own personal relaxation product. How do I create class outlines and stay on schedule? What kinds of handouts and manuals should I make for my students? What blends should I teach in class? Is there a simple way to organize my supplies? What kinds of activities are fun and helpful for students? I took all of these questions to heart, and developed an online program to help you navigate teaching your own live, in-person Aromatherapy workshops. It’s called The Aromatherapy Teacher Training Program (TTP)! I have been training Aromatherapy teachers since 2004, and I’m so excited about the TTP because it allows me to train even more people through Aromahead’s online classroom. The TTP includes a fully developed curriculum that you can use as is, or adapt to your needs. It includes complete, ready-to-print class outlines, manuals, essential oil datasheets, handouts and worksheets you can give to your students. The TTP also guides you through mastering the art of teaching itself—from presenting with confidence, to working with students who have different personalities. 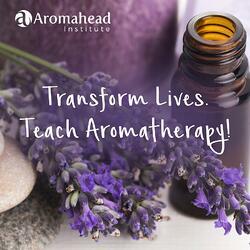 Click here to learn more about Aromahead's Teacher Training Program! I want to share an exciting article about my friend Mustafa, a distiller in the Seychelles who grows cinnamon, patchouli, and coconuts! 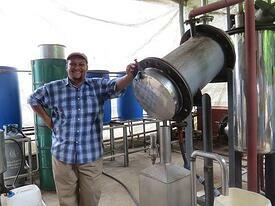 Mustafa is dedicated to reviving the Seychelles’ cinnamon industry, which once supported the islands’ economy, to re-introducing patchouli to the islands, and is branching out to produce coconut oil as well. Read the news article here! Quick is a fun app that makes it easy to take a picture you love, and then put professional looking text over the image. Here’s their website so you can see if Quick is for you! Use Aromatherapy to reduce stress with this easy-to-make inhaler that fits right in your pocket! Aromatherapy inhalers are so convenient. An inhaler consists of a piece of cotton that holds the essential oil, and a small “sleeve” to hold the cotton (the size of a lip balm tube). 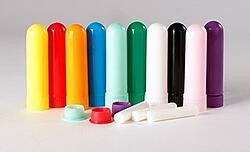 You can take your inhaler out and use it to reduce stress anytime you like. Nobody smells the essential oils but you. Watch this video to learn the recipe! I hope the ideas in this newsletter have you feeling more relaxed already!